‘To have this ecosystem here in the Millyard in Manchester and in New Hampshire is incredibly important to our state|! !|’ says attorney Christina Ferrari|! !| whose practice specializes in helping biotech clients. After earning a master’s degree in medical sciences from the Boston University School of Medicine, Christina Ferrari had planned to pursue a Ph.D. in neuroscience — until she became allergic to the lab rats used in an experiment studying the effects of drug addiction on the brain. So Ferrari faced a crossroads and became intrigued in continuing her connection to the world of science through patent law. Ferrari earned her J.D. from Franklin Pierce Law Center (now the UNH School of Law) and was in the school’s Daniel Webster Scholar Program, the only practice-based honors program in the country to admit members to the bar prior to graduation. Through the program, Ferrari picked up a new passion: litigation. An associate at Bernstein Shur since 2015, Ferrari also supports the biosciences industry as a lawyer and member of the NH High Tech Council’s BioMed/Tech Cluster. 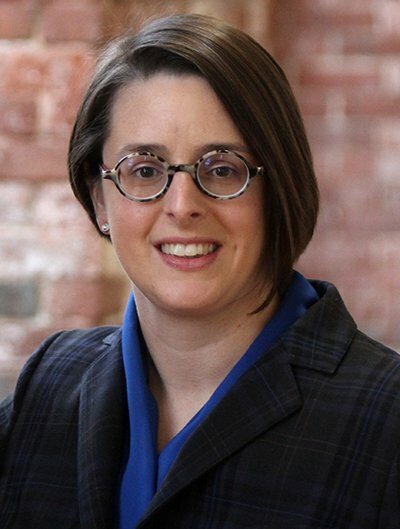 She was elected president of the NH Women’s Bar Association this summer. Q. What does it mean to you to be elected president of the NH Women’s Bar? A. Being involved in the women’s bar has really been the fun piece of my career so far. That’s the reason I do it because I get to work with and learn from and just be around some truly kickass women, and they drive me every day, not only as the president of the bar, but also as a practitioner, because I see certain things that I want to emulate and they push me to be as good as they are 20 years from now. Hopefully I rise to their level someday, so that’s what keeps me going sometimes. Q. What are some of your goals for the association? A. I would like to increase our membership. We have about 200 members. Our members are practicing attorneys in New Hampshire, and we have judges who are members. It’s not just women, by the way. We’re open to everybody and we welcome everybody. I would like to grow our membership to 400. I know it won’t happen this year or next year, but we’re getting a pretty aggressive plan for that now. Q. What’s your perspective of the legal community in New Hampshire? A. We have a very good bar association in New Hampshire. It’s a very collegiate environment to practice law, unlike other states. We’re a fairly small bar, so we get to know each other pretty well. There’s been a lot of press and discussion about issues for women in law in 2018 and what that means, and the same is true in New Hampshire. I think there’s been a lot of good progress for equality and parity, but we still have work to do. There was a gender equality study done by the bar last year. I believe we have some draft results and it shows that there are still issues with discrimination and harassment for women and other groups practicing law in New Hampshire. There’s still a gender pay gap that needs to be rectified, and I think there’s still a shortage of women in certain types of positions of law, for example trial attorneys. I’m a litigator and sometimes I’m the only woman in the court room, and that needs to change. Q. Is there something law firms can do to help women in their legal careers? A. Absolutely. I am really fortunate to work for Bernstein Shur. We have a good amount of women and I think it’s really a model for other law firms here in New Hampshire [in] a couple of different ways. We have a lot of female leaders. We have really amazing parental leave policies that apply not only to our attorneys but to our staff equally, and it applies whether you have a child, whether you adopt, whether you foster, and that is something you really don’t see everywhere. It contributes to an inclusive environment that benefits everyone, not just women. Q. How has your current position given you insight into the growing biotech scene here in New Hampshire? A. I’m not doing patent law these days, but I enjoy counseling companies, especially biotech and medical device companies, on how to get their products out to market or how to prevent issues arising in their business, so I can use my litigation skills to kind of see a problem before it turns into a problem. There’s something about working with scientists and helping them get out this amazing product that’s going to change people’s lives that really appeals to me. I think to have this ecosystem here in the Millyard in Manchester and in New Hampshire is incredibly important to our state because it’s going to put our state on the map even more. It’s going to drive economic development, and if we can have a small part in getting these types of life-saving technologies out to the masses, that’s a good thing to be involved in. I would love to see New Hampshire forever associated with something like that. Q. What are you seeing in terms of biotech industry growth? A. I see a lot of promise, which is really good. I’m seeing a lot of attention on it on a state government level, which is fantastic. I think, in order to have an ecosystem like this grow and turn into the powerhouse we all want it to be, you need different stakeholders and obviously one of the biggest is having state government support. I think we’re starting to see that already – some different tax incentives come through legislation, different things put into place, so businesses will be attracted here, will set up shop here and will bring workers here. I think other states maybe aren’t as nimble as New Hampshire is in getting those things in place really quickly. We’ve seen a huge response from our university system. Obviously UNH has created a lot of different programs and lab space, and we’re setting up our universities and colleges to be partners in these ecosystems, because that’s where our students will get trained in these technologies; this is where we’ll get a lot of our workforce. Q. You’re also on the board of the Manchester Business Council. What made you get involved and what role do they serve in promoting biotech growth? A. I think it’s a great city; it has a lot to offer. As you know, the ARMI project started here and it’s a really exciting project to see happening. So one of the mayor’s initiatives is to get together a business council, which is a group of government officials, folks in the economic development space, business representatives and some members of her administration who figure out if there is something we can do on the local government level to make Manchester even more attractive to certain industries. Biotech is one of those industries we’re looking at. I’m contributing in trying to figure some things we can do to make Manchester more attractive for more businesses to come and set up shop here. Hopefully there’ll be more news on that in the next couple of months. Q. Tell me more about your work with Bernstein Shur. A. I spend a majority of my time as a trial attorney. I represent companies and individuals in disputes that end up in our court system. So my day ranges wildly. Sometimes I’m in the courtroom advocating on behalf of my clients and other times I’m preparing written arguments or different pleadings; it’s really just every step of the way. I’m sometimes in mediation, trying to resolve a conflict, but really I spend a lot of my time counseling clients about not only the dispute itself but really just how I can help their business achieve their goals – whether it’s certain growth or improving a certain process. I also put together teams of people, so I’m kind of a matchmaker in a way and really try to figure out who can best serve the client to address the issues they’re facing. Q. Is it a tough regulatory environment for biotech firms? A. In a lot of respects, the regulation hasn’t caught up to the technology. But the problem is you have regulatory bodies say, “Maybe your technology has surpassed us, but we regulate you and so we’ll figure out how we regulate you later.” So it’s a lot of gray area in regulation, and that’s tricky for businesses because it’s hard to plan around that if you don’t know exactly the regulatory scheme that’s going to apply. The regulatory scheme that does exist right now is really complicated, especially for manufacturing standards. Everything needs to be manufactured consistently and safely, and all of the regulations that go into that are complex so it’s a huge if not the biggest part of the business that needs to be tackled head on. Q. And having that legal expertise helps them navigate that? A. Let’s say you’re a startup company, it’s really important to have legal advice about regulatory compliance early. I think it’s hard for newer businesses or smaller businesses to allocate a part of their budget on legal counsel, but it’s so important because you have to be able to look ahead and avoid issues earlier rather than later, and it saves you money in the end, because hopefully we’ve done our job right then I will have saved you an issue down the line that is very, very expensive.